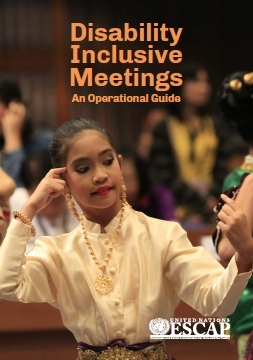 This Guide provides meeting organizers with step-by-step, comprehensive advice for the planning of disability-inclusive meetings. The Guide builds on the Incheon Strategy goals to promote the participation of persons with disabilities in decision-making processes and to enhance the accessibility to both the physical environment and knowledge as well as information and communication services. Crucially, the Guide reaffirms that meetings across all themes are enriched by the full and equal participation of persons with disabilities.